Does myTrainer™ software work with PetSafe® Remote Training devices while mouse, keyboard, camera, or other USB devices are plugged in? Yes, it only communicates with PetSafe® Remote Training devices, so other USB devices are unaffected. How do I remove the application from the notification area? Right click on the icon in the notification area and select “Exit” from the context menu. You may also need to delete the icon from the Startup menu under All Programs. Does myTrainer™ software work with any USB devices? 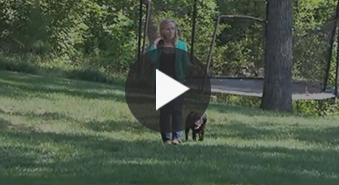 No, myTrainer™ software only recognizes PetSafe® Remote Training devices. How do I extend the life of the battery? The rechargeable Lithium Ion batteries are not memory sensitive and do not require depletion before charging. The batteries come partially charged from the factory, but will require a full charge (4-5 hours) before the first use. Remember—always keep batteries away from flame. When storing the unit for long periods, remember to regularly give batteries a full charge (3-4 hours). This should be done once every 4 to 6 weeks. The Elite Trainers are equipped with a safety feature to prevent over charging. You should expect hundreds of recharge cycles from your batteries. However, all rechargeable batteries lose capacity over time relative to the number of recharge cycles they experience. This is normal. If your operating time drops to half of the original life, contact the Customer Care Center. How do I remove myTrainer™ software from my computer? Run the uninstall.bat program found under the PetSafe folder in Start->All Programs, or use Windows Uninstaller in Start- >Control Panel->Programs->Uninstall, double left click on PetConnect. How do I stop the welcome message from opening? Uncheck “Show startup message” in the lower left hand corner of the Home tab. Lift the rubber cover protecting the Remote’s Micro USB Port and insert one of the Micro USB connectors (1A). Insert the USB connector on the opposite end into the power adapter (1B) and plug into a standard wall outlet. Charge the Handheld Remote for 5 hours for the first charge. Recharges take only 3-4 hours. Note: The Status Gauge will have a solid red LED while charging and a solid green LED when fully charged. Note: Approximate battery life between charges is 40 to 50 hours, depending on frequency of use. Ensure the Handheld Remote is closed when no longer in use for longer battery life. Note: Both the Handheld Remote and the Pendant™ can also be charged by plugging into a USB port on your computer. Charging time may be longer than when using the power adapter. Power up the Handheld Remote by sliding it open. You will see the status gauge display the remaining battery life. 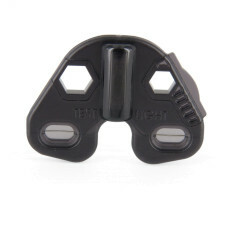 A black nylon collar is included or most collars up to ¾” wide can be used with the Pendant™. A non-metallic collar is recommended. If using a metallic collar ensure it does not make contact with the Pendant™ Receiver. Place Pendant™ Receiver face down on a hard surface (i.e. table). Insert collar into loops and rotate through. 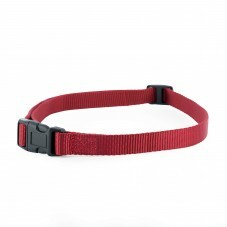 Ensure collar is in the inner loop and strap is threaded through only once. Lift the rubber cover protecting the Pendant’s Micro USB Port and insert one of the Micro USB connectors. Insert the USB connector on the opposite end into the power adapter and plug into a standard wall outlet. The red light will appear. Note: The Handheld Remote and the Pendant™ Receiver can both be plugged in to the charger at the same time. USB Cable placed in the Handheld Remote Micro USB Port. Charge the Pendant™ until the green LED comes on and is solid. Recharges take only 3-4 hours. When charging is completed, replace the rubber cover. Attach the Pendant™ Receiver to a Collar A black nylon collar is included or most collars up to ¾” wide can be used with the Pendant™. A non-metallic collar is recommended. If using a metallic collar ensure it does not make contact with the Pendant™ Receiver. Place Pendant™ Receiver face down on a hard surface (i.e. table). Insert collar into loops and rotate through. Ensure collar is in the inner loop. Press and hold the SmartTouch On/Off buttons (2C) until the green LED comes on and the Pendant™ beeps low to high. Release the SmartTouch On/Off buttons. The green LED will flash once every 10 seconds until the Pendant™ is turned off. The flashing light indicates the battery status and that the Pendant™ is ready to receive a radio signal from the Handheld Remote. Once the Pendant™ has been turned on, press the Tone button of the Handheld Remote. Upon pressing, the Pendant™ should beep for as long as the Tone button is pressed. If it does not, see “To Pair the Handheld Remote and the Pendant™ Receiver”. Note: To extend the life of the battery, turn the Pendant™ off when it is not in use. Approximate battery life between charges is 40-50 hours, depending on frequency of use. Press and hold the SmartTouch On/Off buttons (2C) until the red LED turns off (approximately 3 seconds) and the Pendant™ beeps high to low. Release the SmartTouch On/Off buttons. To extend the life between charging cycles, turn the Pendant™ off when it is not in use. Take the Pendant Receiver off your pet. Press and hold the SmartTouch On/Off buttons for 5 seconds. The Pendant will beep and the LED will flash. The Pendant will respond and pair. If the Pendant does not respond, please contact the Customer Care Center. By default, myTrainer™ software will have a shortcut icon conveniently placed on the desktop or in the Start menu under the PetSafe® folder. To start the software, just click on either icon. It will automatically detect and activate itself when a Pendant™ Remote Trainer device is plugged into a USB port. When the device is unplugged from the USB port, myTrainer™ automatically minimizes itself to the notification area. When minimized, myTrainer™ can be identified by the PetSafe® icon while residing in the notification area. To restore myTrainer™ to the viewing area, double click on the PetSafe icon or select Show from the right click context menu. If a Pendant™ Remote Trainer device is plugged into a USB port, its information will be displayed in the Training System Summary area. Otherwise, the Training System Summary will be blank. The first time the Pendant™ Receiver or Handheld Remote is plugged into a USB port, a message appears advising that a new device was detected and the driver software is installing. When the driver has been installed a message will display stating the USB input HID compliant device is ready to use. It will be necessary to restart your computer if prompted to do so. myTrainer™ software may be hidden by clicking on the red X in the upper right hand corner. To close the software, click the right mouse button while on the Home tab, then select Exit from the context dropdown menu. To close myTrainer™ when it is hidden, click the right mouse button while hovering over the PetSafe® icon in the notification area, then select Exit from the context menu. myTrainer™ software is comprised of four tab pages and a Summary section. When at least one device is plugged into the USB port, the Summary section is always visible; while the tab pages can be changed by left clicking the mouse on the tab that interests you (Fig 2). When no devices are plugged into the USB ports, you will be limited to the Help tab, despite any tab you may click on. In the upper right hand corner of the myTrainer™ screen is the control box. Inside the control box are minimize, maximize, and close buttons. The minimize button sends the myTrainer™ window to the Task bar, generally located at the bottom of the screen on Windows operating systems. The maximize button expands the myTrainer™ window to take up the whole viewing area of the screen. However, the Summary area and tab pages will not expand when the maximize button is pressed. Device image buttons allow you to select between the Pendant™ and the Handheld Remote when both are plugged into USB ports simultaneously. The buttons are outlined in green when connected to the USB port and by red when not connected. Device image buttons that are outlined in red will ignore mouse clicks. When only one device is plugged in, it is automatically selected and its information displayed. Only the currently selected device’s information will be displayed in the Training System Summary section. This information can be copied to the clipboard by using the right click context menu option and pasted into an email when consulting Customer Care. The battery symbol displays the estimated battery capacity. When the capacity is above 20% the battery is green. When the capacity is between 10% and 20% it will be yellow. When the capacity is below 10% it will be red. The Home tab is shown by default when myTrainer™ software is first executed. Once the update process has started the device must be left plugged into the USB port until the update completes. When the device is unplugged during an update, it will go into loader recovery mode and you must retry the download so that the device is usable. To start the update process, click the DOWNLOAD button. The status bar at the bottom will track the progress. When the process completes, a message will appear confirming the device has been updated or that the process failed. The Usage tab displays the current totals of the training activity counters. Each time a stimulation or tone button is pressed and released, the counters incrementally increase. The counters will rollover to zero when they surpass 65,535. At any time the user can reset counter by pressing the Reset button. The Pendant™ Remote Trainer also tracks the total on/off occurrences. This counter will also be reset to zero when the Reset button is pressed. The Help tab contains links to the Product Manual, FAQs, the PetSafe® website, Product Registration, Customer Care Center email and contact info, the PetSafe® Cloud dashboard, Twitter, Facebook, YouTube, and the official PetSafe® blog. A single click on the Product Manual will launch the Pendant™ manual with Acrobat® Reader®. A single click on any of the other Help buttons will launch your default web browser with the path necessary to send you to the intended web page.